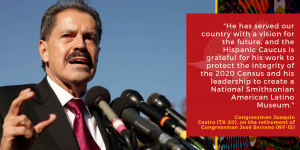 “A champion for his constituents, the American Latino community, and our nation, Congressman Serrano will be missed upon his retirement at the end of this term. As a member of Congress and the New York State Assembly, Congressman Serrano has served the American people for over 40 years. His leadership and legacy in Congress has paved the way for future leaders, leaving a lasting impact on Capitol Hill. 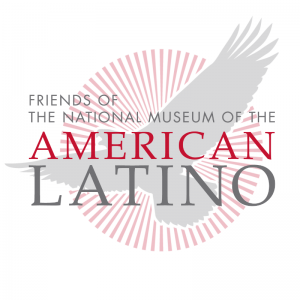 An original co-sponsor of the legislation to authorize a Smithsonian National American Latino Museum, we are grateful for Congressman Serrano’s commitment to preserving the impact and influence of American Latinos throughout our nation’s history. 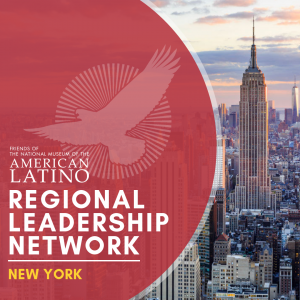 His personal story beginning in Mayaguez, Puerto Rico and ascending to the halls of Congress over the course of his career exemplifies the need for an institution to share these stories, and we will continue the fight for a National American Latino Museum on our National Mall that will include his legacy.